There's a great difference between an article and a book. A book often manages to be timeless, and is constructed in such a way as to allow the imagination to construct a whole world from the details within its pages. The development of characters, the relationships between the characters and the setting, the choice of words used to convey meaning. An article captures only a snapshot of life, which is useful for sharing an idea, but not useful for sharing a story. In today's world of blogs, video clips, and online news articles, I'm concerned that the reading of books may dwindle, causing the creation of books to fall away as well. And this makes me want to read more, and as I read, to share about the worlds I encounter. This is a collection of books I've recently read, along with the thought they've inspired in me. I finally got around to finishing up Obama's Dreams from my Father, which turned out to be a fantastic book. Having grown tired of political conversation, I was glad to find that the book had almost nothing to do with politics -- it was a narrative about the life of a man who had to come to grips with conflicting ideas of his identity... conflict not only within himself, but also from those around him who weren't always sure what to make of him. It's in this context that I've found myself as well -- not only now, but also in the reality of my childhood. The split nationality, feeling almost (but not actually) at home in several places... this resonates strongly with me, and the smaller our world becomes, the more I'm sure others will feel this same sense of disjointed identity. A while back, I tried explaining to my Korean mother about this feeling, and she said that my description felt like a sense of longing for home, which she periodically experienced. However, for her, "home" actually exists -- she could take a flight to Seoul and then take a bus down to the little town of Ha-Dong in South Korea and literally be back home. For me... it feels like there is no home. There is no sense of a resting place. For many people with a first generational split in ethnic identity, there is only restlessness. And now having read a second book on such a familiar subject (the first was One Thousand Chestnut Trees), there is a morbid sense of comfort in realizing that so many others feel the same detachment. The next book I'm reading is a collection of science fiction books -- the "Best of 2005," it states. With as busy as this summer has been for me, I'm finding less and less time to sit and read; the only way to find satisfaction with reading is to wade through a bunch of short stories -- a novel will simply take too long, and I don't feel like waiting that long for plot resolution. Short stories get me through the whole range of plot-inspired emotion, which is a large part of the appeal of reading fiction. Apart from a series of Larry Niven books, I haven't read a lot of science fiction. At a young age, I broke into reading novels with a bunch of Dungeons & Dragons fantasy novels -- mostly DragonLance, and an occasional Ravenloft book here and there. Lots of swords, dragons, magic, etc., etc. However, the medieval-fantasy genre got a little tiring and repetitive, so I stepped out of it for a while. I think that my fickle mind can only handle escaping into a familiar fiction landscape for so long before I need some change. I'll try the science fiction thing for the next 650 pages and see what happens next. I just started reading The Cluetrain Manifesto, a book with a title that's a bit too clever for the content. Several months back, one of the executives at my place of work mentioned the book, and recommended it to anyone who was interested in disturbing the cultural complacency of typical corporate life. He said that there were ideas in the book that would make most executives uncomfortable, hinting that the book suggested a shifting of the balance of power and influence away from high-level executives and into the hands of your typical employee. Of course, having read Chris Anderson's The Long Tail and Kevin Kelly's Out of Control, these ideas are nothing new. The idea of moving away from the traditional top-down leadership style and towards a style that leverages the knowledge and experience of the people on the ground by way of technology (specifically, the user-generated content on the internet) has been talked about for the last ten years now. It wasn't until a couple of chapters into the book that I looked at the book's publish date: 2000. In technology years, it's ancient. I suppose that when it was written, it explored relatively uncharted territory, and the irreverent style (swearing... in a book on business and leadership?!) of the writing lent to a "we're boldly blazing the trail" attitude, which perhaps made it a compelling read. Currently, I'm just trudging through it. I hate abandoning a book while I'm still in the middle of it, but I'm tempted. The book has become repetitive, and I feel like the entire message of the book was summed up in the first couple of chapters. Maybe I'll read a few more and see what happens. But I may very well drop this book for the next one on my list. Having finished reading Mira Stout's One Thousand Chestnut Trees, I'm left with a bit of an ache over my family in Korea, and about the half of me that exists across an ocean. This book jabbed at the part of me that looks for some sense of cultural identity; there's a profound emptiness that grows more noticeable as I get older -- an awareness of the inability to tell stories of "my people," whatever that means. Now that I have children, I feel like I have so little to offer in the way of culture and tradition. It's odd to be aware of a void. Growing up, I often heard adults (both American and Korean) tell me how fortunate I was to be able to have a sense of two cultures, both Korean and American. That's all fine and interesting, but as a kid, the notion of "culture" amounts to food and language; there is little sense of tradition, or heritage, or story. It's easy for a kid to be proud of eating kimchi and bulgoki, and bringing a Korean flag to school for cultural-awareness day, and being able to tell friends how to say "I love you" in Korean. But that's not culture. Culture is deeper. Culture is identity. As I've gotten older, I don't feel as though I have two stories to tell, as I had been raised to believe I would. Instead, I have two halves of a story, neither of which connect in any meaningful way. The two stories happen to cross paths at a point in history, and it's in that crossing that I was born. There are no ties to an ancient past, no deep roots in any land; it's a bit like being a cultural orphan. And yet somehow, this void and lack of history is my identity, and it's the identity of millions of people born into multi-cultural families. This book does a fantastic job expressing this two-halves identity. We half-breeds all share this. And that is both fascinating and reassuring. 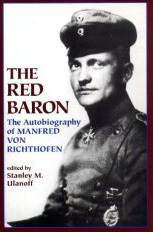 I'm currently reading the Red Baron, edited by Stanley M. Ulanoff. I recommend that particular version over previous editions, on account of the great job Ulanoff does in patching up the rather disjointed journal-style writing of Manfred Von Richthofen. I'm only about half-way into it, but I'm really enjoy it. I've never read a book about war before, and while I'm generally opposed to war, the way in which the book describes the mutual respect between WW1 fighter pilots is fascinating. Throughout the book, Richthofen refers to the enemy English pilots as "friends," and describes the air fights in the way you might describe a fight between two boxers who can shake hands after a fight. The death of the enemy isn't the objective; simply downing a plane suffices, which counts as a victory for the pilot who is still in the air. It's a breath of fresh air, really -- to read of people who are engaged in war respecting their enemies... and not "respect" in the way one is expected to respect a formidable opponant, but respect in the way that, after a good air fight, two enemies can chat in mutual respect. ... One of the Englishmen we had shot down was taken prisoner, and we went over to talk to him. He, too, inquired about the red machine. It was not unknown to the troops in the trenches, who called it "Le diable rouge." The rumor had spread in his squadron that a girl piloted the red machine, somewhat like a Joan of Arc. He was very surprised when I assured him that the alleged "girl" stood before him at the time. He was not trying to make a joke; rather he was convinced that only a maiden would actually sit in the garishly painted crate. In another event, the Red Baron downs a plane, and in the process, crashes his own. It seems that the Germans were generally more honorable than their English enemies. I felt a deep compassion for my opponent and decided not to send him plunging down. I wanted to force him to land, for I had the feeling that was already wounded. He did not fire a shot. At about five-hundred-meter altitude, a malfunction in my machine during a normal glide also forced me to land before making another turn. Now something quite comical happened. My enemy in his burning machine landed smoothly, while I, the victor, turned over right near him on the barbed wire of the trenches of a reserve emplacement. A sporting reception followed with both Englishmen, who were more than a little surprised by my crash, for, as I mentioned, they had not fired a shot at me and they could not imagine why I had made a forced landing. Then came what was, in my view, a typically English dirty trick. He asked me why I had acted so carelessly in landing. I told him the reason was that I could not do anything else. Then the scoundrel said that in the last three hundred meters he had attempted to shoot at me, but his guns had jammed. I had given him a gift of his life. He took it and subsequently repaid me with an insidious personal attack. It's been a fun read so far. I look forward to getting through it to read more of his adventures. It kind of makes me wish I had stuck with my local Civil Air Patrol unit when I was a kid; I'd be a pilot right now. If you've ever paid close attention to the side-navigation of this blog, you'll notice that there's a "currently reading" section that lists the book that I'm reading. Most of my reading is done to and from work, on the vanpool that picks me up in front of my house and drops me off in the work parking lot. It's a short trip each day -- just a 12 mile drive, but the 20 minutes of drive-time each way is enough for me to crank out a chapter or two in whatever I'm reading, and it doesn't interfere with the rest of my life. If I could figure out how to work on my projects (car, motorcycle, CNC machine, welding, etc., etc.) on the way to work, I'd really get some things done. The last book I read was Emberto Eco's Foucault's Pendulum, which was probably the most intellectually engaging work of fiction I've ever read. Each chapter opened up a new saga, each new saga intertwined with a larger story of fate, conspiracy, mysticism, and all sorts of other literary buzzwords. The meat of the story was so thick, I had to stop reading after each chapter, just so I could digest what I had read. From start to finish, I think the book took me nearly a year to read, but my three-year old daughter is to blame for that; she misplaced it months ago and it remained hidden until a few weeks ago. It's a fascinating book, and the way the author strings so many ideas together without losing the you in the details is genius. I'm now reading Kevin Kelly's Out of Control, which is subtitled, "The New Biology of Machines, Social Systems, and the Economic World." The book was written in 1994, and it's becoming clear that much of today's technologies spawned from ideas that this book captured so elegantly. Kelly mentions distributed systems in the areas of robotics and tracking technology, closed-loop industrial systems that recycle their own waste or sell it to other industries, and the organic nature of technology as humans become more dependent on the tools we create to make our lives easier. It's creepy to see how much of what he wrote has come to pass. The most interesting thing I've pulled from the book thus far is a new way to look at life. We western-thinking folk tend to view reality at the granular level, such that we look at individual components without seeing the bigger picture of the system in which those components exist. When it comes to defining life and that which is alive, we tend think in terms of organisms, and not in terms of relationships between organisms, and relationships between organisms and non-living things. The monarch butterfly, as a caterpillar, depends solely on the milkweed plant, and as such, it develops a poison derived from the plant which makes the butterfly unpalatable. Through whatever evolutionary processes, the two have formed a relationship that grew over time and are now locked in orbit. Without the milkweed, there is no monarch butterfly; the definition of the insect is inseparable from the plant. We see these kinds of relationships everywhere in the plant and animal kingdoms. It is well known that fruit-eating birds pass the seeds of fruit through their gizzards, and the seed coat is scarified, allowing the seed to germinate. Without the birds, those seeds wouldn't grow. On a grander scale, the mutually dependent relationship between animals and photosynthesizing plants (with the exchange of oxygen and carbon dioxide) demonstrates a living system that encompasses every living organism. While we may look at a single organism individually and deem it alive, the more relevant perspective is that organisms form living systems, and it is those systems that more accurately define life; no organism is an island. With two organisms, such a living system is easy to understand. But there are also dependent relationships between organisms and non-living things. Prairie flowers depend on fire; without it, their seeds will never germinate. The definition of those flowers is inseparably tied to the definition of fire, and together, they form a living system made of both living and non-living components. Going back to the gas exchange between plants and animals, those non-living gases are also a part of this system. Everything is connected... and that connectedness is the living system. It's a fascinating concept, and when you consider that a single living organism is comprised largely of non-living things (whether bones or bark or water), it makes a lot of sense. Life is not a tangible thing - it is a system, or a force, and it brings individual elements together in chaotic and unpredictable unity.